I’ve never grown out of my love for myth and faery stories. In their purest forms, they’re primeval, subversive, eldritch, enlightening, sinister, unsafe and ultimately unknowable. When I graduated up from Grimm, it was to Warner Townsend and Dunsany both of whom have moulded my views of what Faerie is, or may be: minutely detailed, threatening worlds with their cold, inhuman and amoral peoples. Get some of that into a modern day take of faery, and I will be satisfied. Four very different authors. Four very different takes on faery. In three of the stories, Faery intersects with this world, to the danger and discomfort of mortals and fae alike. The variety of approaches is quite fascinating: Gus Li with a tale of homeless youth in present day Cardiff, Skye Hegyes with a story of changeling set in a timeless village any Grimm reader would recognise, and J. Scott Coatsworth in a post-Apocalyptic world half-drowned in irreversible climate change and seen through the eyes of a trans man. Faery tales depend on world building. Not getting us to suspend our disbelief (a dreadfully limiting idea, I think) but *to believe* something fantastical or impossible, like the Red Queen in Alice. But at the same time, we have to realise that the fantastic is there. So while the point of intersection with Faery is about difference, discrepancy even between the MC’s life/character/actions and what is normally ‘expected’, we have to see and understand that discrepancy in order to see and understand the wonder the MC must accept and assimilate. If we’re going to be disturbed by the clash of mortal and magic, then we need the reminders of our mortality. This anthology achieves that exceptionally well, I think. All three ‘intersectional’ stories have either human protagonists or in Hegyes’ case, a changeling who is culturally impressed with ‘human’ because of his upbringing with a human mother. That initial comfortable sense of “I recognise this!” is what gives the stories their jolt when the MCs are jerked into the shadow-lands of myth. The reader gets to empathise with the MCs first and the stories turn the familiar, even if it’s only faintly familiar, on its head. And it’s all very well done. You’ll notice I haven’t mentioned the fourth story, yet. That’s because it doesn’t intersect with the human world at all. Brandon Witt’s story is set fully in Faery with Fae characters. This story, more than the others, reminds me of the perverse, amoral societies that Warner Townsend wrote about; a place where casual cruelty is the norm, where the denizens of the world are so… well, cold. Grotesque. Inhuman. A society where you can well imagine the national sport is watching a cat torment a mouse. Witt evokes this quite brilliantly. This is a disturbing story of disturbing creatures, and the world building, achieved in just a few words, is epic. You’ll have no familiar starting off point, gentle reader. You’ll be plunged straight in. Hold onto your hat. All in all, a highly enjoyable anthology, and I’m delighted to have had the chance to read it. I’m delighted today that Gus Li, Brandon Witt, Skye Hegyes and J. Scott Coatsworth are here to tell us a little about the gold they held. Did you base your universe on any established traditions, such as Irish, Nordic, etc.? How is it incorporated into your world? Gus: Mine is fairly generic European/English in that the faerie world exists somewhere else, overlaps with our own here and there, and poses dangers to mortals who wander into it. Since the story is set in Cardiff, I chose some Welsh names for some of the faeries. Brandon: Oh, goodness. I’m going to sound so self-absorbed, but here goes! 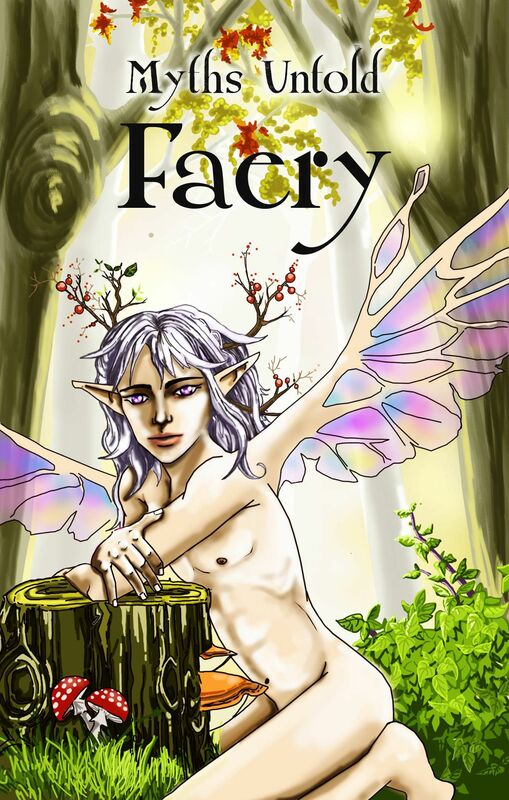 I based this short story on the fairy culture I’d already created in my Men of Myth series. That’s the world it’s set in. However, I stole the idea of fairies being obsessed with beauty, which is how my fairies set up the royal hierarchy. Skye: Umm… I’m probably going to be ripped a new one for this, but I’ll be the first to admit the only thing I know about fairies and Faery comes from the fairy tales I’ve read. There was a poem I read while attempting to do research for this that I added to that small collection of knowledge (and of course, I can’t remember its name), but even that only influenced what happened when the fairies gathered. Scott: I did draw a little on Irish/Celtic myths and used/abused the language terribly when writing through the veil. But any elaborations, mistakes, or outright lies are purely my own. What about that particular tradition appealed to you? Gus: I didn’t want to adhere to anything too strictly, so I used the mix-and-match approach. There’s a wealth of traditions and stories to draw from, and while there are similarities, there is also variety—sometimes even from one region of Britain to the next. Brandon: I really enjoy playing with beauty and darkness in the same story. I wanted to explore how dark an obsession with beauty could go. Skye: I’ve always heard that the main rule of fairies is that you don’t eat or drink anything they offer to you. It’s like a drug—the strongest you’ll ever find—and once you’ve had a taste, you’ll go mad without it. How powerful does fairy magic have to be to cause madness? Scott: I’ve always loved the sound and the look of Irish/Celtic words. And for me, they just go with Faery and fairies or the fae. Yes, I know many cultural traditions have the fair folk, but these are the ones that appealed to me, even as a child. And I guess that never went away. What about your world sets it apart from the worlds of myth and legend? How did you make it your own? Gus: Aside from the aforementioned—the Otherworld overlapping with ours and being dangerous—I constructed my world completely from imagination. The characters, while loosely based on creatures from myth, are also original. Brandon: Honestly, I threw nearly everything I knew about fairies away and made them how I wanted them, with the exception of their connection to nature. I love that aspect. Skye: Once again, I feel like I might be staked for my answer, but I honestly don’t know. I took a mish-mash of everything I’d ever been told and combined it with my own takes on Faery and fairies, and turned it into a tale. Isn’t that what all storytellers do? Wrap you up in a story that mixes imagination with myths and legends? Scott: I like to mix genres, so I set my story in a future San Francisco partly swamped by climate change. I liked bringing a little magic and mystery into this future setting, and it also features one of my first trans characters, which was a big leap for me as a cis guy. But I did my homework and got some of my trans friends to beta me out of a few issues I might otherwise have had. Does your story contain any folklore or legends, such as the faerie ring, faerie music, or the faerie repulsion to iron? Gus: I used the superstition that if a mortal eats or drinks anything in faerie, they will have to go back. I also used the idea of glamour—people seeing a beautiful illusion rather than what’s actually there—and the idea of the faerie race dwindling due to problems with reproduction plays a fairly large role in the story. Brandon: Mine doesn’t. I’m not a traditionalist in many ways. Skye: I mentioned above that mortals shouldn’t eat or drink fairy consumables, but I also used the adage of milk and honey being favorable to fairies and the fairy rings. I rather like the idea of those bits of myth and legend. Many fairy tales and legends follow a classic arc, whether it’s to teach a moral lesson or explain a natural phenomenon. Does your story resemble an archetype like the hero’s journey or the mortal who paid the price for messing with things beyond his understanding? How so? Gus: Only in that mine is a story of someone who is outcast and on the fringes of society “finding his people.” Though in this case, it might not be a positive thing for everyone involved. Brandon: I wouldn’t call it a lesson or moral, though it does highlight the danger of obsession with beauty and power. Still, I’d say it’s more of a story of sacrifice for brotherly love. Skye: Maybe not a moral per-say, but a large part of the lesson I wanted to be taken from Tyler’s story was that it’s OK to be different, and you must learn to accept your differences and be who you truly are. Scott: Mine’s a quest, as many stories that I write tend to be. It’s actually a couple quests in one. Tris is on a quest to find his brother. Colton is on a quest at first to find himself, and then to find Tris… but you’ll just have to read it to see what that’s all about. *grin*. Faeries are part of mythology the world over, past, present, and future. Called elves, brownies, the fae, and more, they evoke a sense of wonder and a little danger. Faery has its own rules, and humans enter at their peril. In this spirit, we bring you the first book in the Myths Untold anthology series—four stories from the land of the Fae: a homeless man in Cardiff and the luck that could destroy him; the trans man in future San Francisco who falls for an elf; the village boy who has always been a little different; and a faery prince whose birthright was stolen from him. Despite beauty and luck, something about Glyn makes everyone uncomfortable. Homeless on the streets of Cardiff, he has nothing to keep him going but his friendship with Farrokh. Through stealing and fortune’s occasional favor, Glyn keeps them alive. But then homeless youths begin to disappear, and when Farrokh goes missing, Glyn begins to discover the reasons behind both his luck and the way people react to him. Determined to save his friend from a danger he never imagined, he enlists the help of Lleu, who might be an ally, or might be manipulating Glyn to achieve his own goals. In a species that values beauty above all else, Quay looses both his freedom and his birthright as prince of the fairies. Lower than an outcast, he watches over his younger brother, hoping against hope that Xenith’s rebirth will provide safety and positions that has slipped through Quay’s grasp. Though he expected kindness from no one, Quay gradually starts to trust that there is more to life, even for the likes of him, as sexual encounters with Flesser, a fairy barely accepted himself, turn from lust to love. Quay knows having forbidden relationships will be his undoing, but he is powerless to turn away. With his pointed ears and a tail, Tyler’s always been different than the other children, but until Marsh, a brownie tells him he’s a changeling, he never thought he wasn’t human. Now he will discover what faery life is like, and just how being a changeling could change his life. On the way, his ties with his mother will be pushed and prodded even as his friendships grow and his love life blossoms. However, in a village of God-fearing people, those who are different are spurned and Tyler will discover how much trouble a fledgling changeling can get into. In the not-too-distant future, San Francisco has been swamped by rising sea levels caused by global warming, and has only survived by building a wall to keep the water out of the heart of the City. Colton is a trans man barely getting by on the canals outside the wall. Tris is an elf who has come to the human world on his journey to become a man. Fate brings them together, and everything changes for Colton when he sets out with Tris to find the elf’s missing brother, taking Colton behind the Wall for the first time. August (Gus) Li is a creator of fantasy worlds. When not writing, he enjoys drawing, illustration, costuming and cosplay, and making things in general. He lives near Philadelphia with two cats and too many ball-jointed dolls. He loves to travel and is trying to see as much of the world as possible. Other hobbies include reading (of course), tattoos, and playing video games. Brandon Witt’s outlook on life is greatly impacted by his first eighteen years of growing up gay in a small town in the Ozarks, as well as fifteen years as a counselor and special education teacher for students with severe emotional disabilities. Since then, Scott has gone back to writing in a big way, finishing more than a dozen short stories – some new, some that he had started years before – and seeing his first sale. He’s embarking on a new trilogy, and also runs the Queer Sci Fi site, a support group for writers of gay sci fi, fantasy, and supernatural fiction.